I know I’m like the boy who cried wolf here…but this is hands down my favorite quilt to date. This quilt is very “me”. I was a little sick of doing quilts with squares squares and more squares, so this was a nice way to change it up. The quilt blocks are made using pattern pieces, but the blocks go to together surprisingly easy and it’s a nice way to dip your toes into template patterns if you haven’t yet. The circles are appliqued on…I used invisible thread, which is a lot like sewing with fishing line if you’ve never used it. The pattern includes a crib size also…I’ll show you that one after I get better pics. I quilted it with brown thread to match the background triangles and avoided quilting the circles….it gives them kind of a 3D effect in real life. The pattern for this is in my Pattern Shop. I love this quilt! I would love to make it. I love that brown you used so thanks for pointing out which brown it is. I also love the quilting, and the way those circle pop off the quilt. What a cool project! It really deserves to be your fav! So awesome! You are very talented :) Not sure I'd have the patience to pull this off. Love it! The circles are a great touch! I so love this. Great work! It is a gorgeous quilt! Once I get the hang of quilting, I'm going to attempt it! Love it. Reminds me a lot of a Heather Mulder Peterson quilt! The fabrics, I mean. But they aren't…just reminds me of her stuff. So cute!! It is beautiful! I wish I know anything about quilting. :) Love it! i just love it! very nice work! Another beautiful quilt! 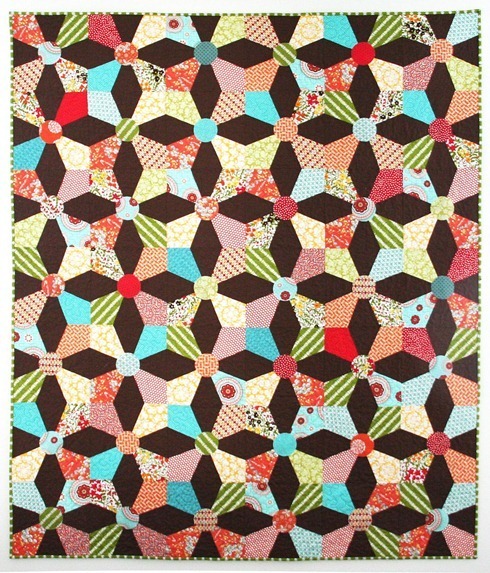 Did you use your Accuquilt cutter for this? I have to agree! It's fabulous! And something totally different! Love it! I love your color choices. This is a beautiful quilt! Its a beautiful quilt, I love the colors! So amazing!! Can't wait to see the crib one. Oh so striking! I just love it! Great job. I love all your patterns, but this one is hands down my favorite! Love everything about it! Ditto, Love all your patterns. Have not done applique, but I am willing to try because I love the pattern and the color choices! I seriously just love it too. I think I need to buy the pattern. It makes me a little nervous, but you have to start somewhere learning things right. Thanks for the email and encouragement! Wow! That is stunning! I love it. THat is a wonderful quilt! You are quite accomplished I see with quilting. I'm too timid to attempt that! I would like to though someday…. Oh my gosh you've done it again! I'm totally in love with this! I've never been a big fan of the kaleidoscope patterns but the way you used that rich brown has changed my mind! Sooooo pretty! I am impressed that you remember all the lines you used. That's a beauty! Can you come to NC to teach me to quilt? And bring all of your fabrics, too? Wow!!! I Love it, it is so vibrant and beautiful! Great work. Beautiful quilt! Love the solid brown backing. Your quilt looks fantastic. I love that you used chocolate brown! I love this quilt. Maybe I'll work up the courage to try something that's not squares and rectangles! Absolutely stunning :). I could look at this quilt for hours! Great job. The way you mixed up prints from different collections keeps the quilt unpredictable and fresh. Love it! Perfect for using up random pieces that we all have!!! Very pretty! Although I am usually only attracted to sqaures, etc (that's why I love your blog) I love this quilt too! One of my favourites too. Have to get around to making one though. Looks fantastic, colours are great, well done for listing so many fabrics. Love this quilt!! I also love the name…it definitely reminds me of looking through a kaleidoscope! I love it! The brown solid makes all those colors pop. i love love love this. Seriously – such a great design! Any tips or things to know before using invisible thread? I have not been interested in quilting until I seen this. It is absolutely gorgeous and the fact that there are no defined squares makes it even more beautiful!! Great job. I am in awe, once again. I wish I could find the time to make as many beautiful quilts as you do. And with little people! Amazed. I love this quilt! I could stare at it for hours! So much delicious color! Fabulous movement. My eyes just want to keep roving around enjoying it. What a treat! WELL DONE. Also, thanks for the detail about quilting thread color and approach. That is a great quilt…don't know if I could do it at this stage of my quilting! You are so sweet to list all of those fabrics….thanks for sharing. love this quilt, the colors, everything about it! thanks so much for sharing it! Wow…that striped fabric gives the quilt movement….I love looking at it. Great job! are you trying to Key..ill me?" I'm thinking the same thing about both of these new patterns and the beautiful little stacks okay…big stacks of fabric SITTING next to my sewing machine!!! I love this too! I especially like the brown background and don't usually like dark backgrounds. I am going to have to buy it and give it a try! 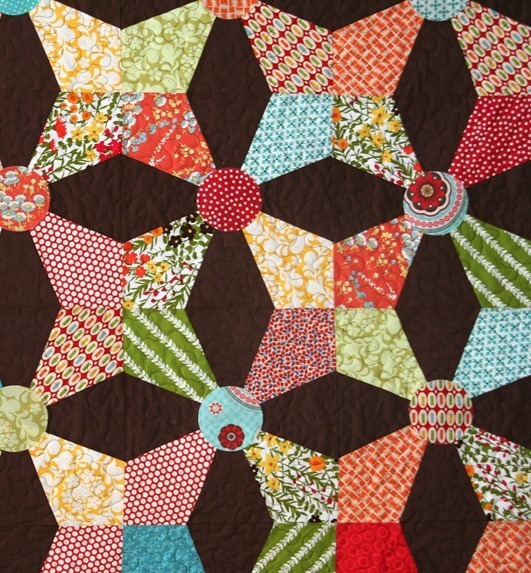 Lovely quilt and I am so impressed with your piecing and perfect circles. Templates…ugh! Did you use an acrylic template or one you made from cardboard/plastic? Oh my gosh! 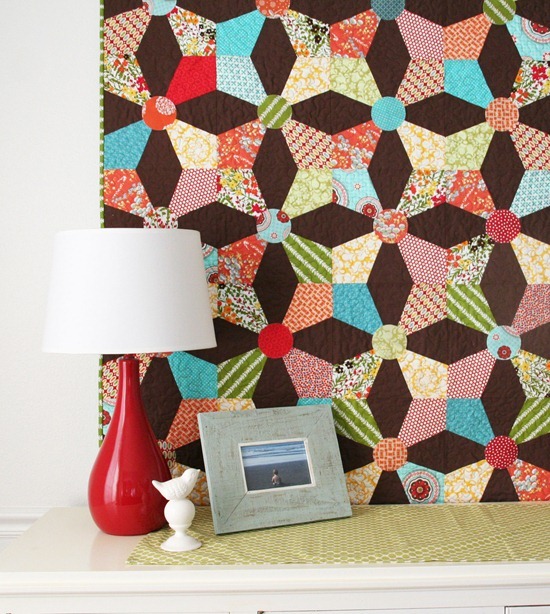 This quilt is fabulous – I love the chocolate brown. i LOVE this quilt…TOTALLY my style too. Hugs to you and yours. Hope you are doing well. I'll have to try my hand at this one once school slows down a bit. I just finished piecing an Ohio star quilt before my semester begins. Okay, I just bought mine, along with two adorable fat quarter bundles. My only question is: with the template, do you cut with your rotary cutter? Any tips on that? Terrifies me, to tell the truth. I absolutely love this pattern! This is definitely going on my list of quilts to make! That is beautiful. Simply beautiful. This quilt is so cool. It sounds like it is your own pattern. Do you have it for sale?